Boomers and seniors are opting for step through bikes more and more every year. There is a lot to be said for ease of mounting and dismounting especially if you are not as limber as you once were. (And who is?) Also, rental agencies like them for their versatility. A lot of step through riders have become real "converts" and would never go back to a more "conventional" bike. They are getting great reviews from the folks that actually ride them. The idea that they are just a woman's bike just does not hold true anymore. Bicycle manufacturers have finally come to realize that there is a huge market potential for bikes that are easy to board. Now they are jumping on the bandwagon and coming up with designs and materials for step through bikes that overcome the weight-bearing limitations of the old designs. Models are available that will accommodate riders up to 300 lbs. Most step-through bicycles feature a "pedal forward" design where the pedals are slightly forward of the seat tube. This means that often the rider can maintain the proper seat to pedal distance and still put their feet flat on the ground while seated. This makes the wheelbase a bit longer than a conventional bike, and has a small effect on the handling but, it actually enhances the riding comfort. 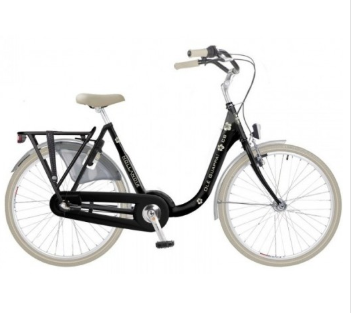 Availability is excellent online but a bit limited in bike shops which tend to be youth-oriented. Other than the frame, the other components are all standard. Actually, recumbents and tricycles are step-throughs also so that gives us even more options. If you are getting to the point where you have to lean your bike way over to mount it your next bike should probably be a step through. and true, step through bikes. The EZ Boarding bike from Biria is one of the coolest bikes that is designed specifically for boomers. 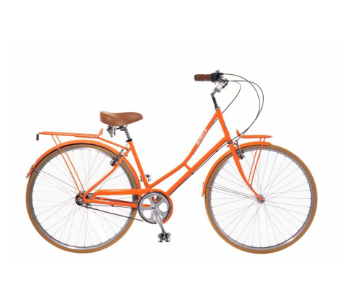 It is a comfort/commuter bike that comes with raised handlebars, chain guard, fenders, rear rack, and a very unique frame. Looking for more bike styles? Go here.